On a crisp day in late September, a brawny man with a full sleeve of tattoos stood in front of the counter at Honeycomb Creamery, raving about the Sweet Corn with Blackberry Jam ice cream. He had come in a few days before, and the Honey-comb bug had bitten him hard. “I was trying so hard to, like, memorize everything to tell my girlfriend later, and finally I was, like, ‘I just gotta go back in there,’” he says. Honeycomb’s owner, Kristen Rummel, standing behind the counter with scooper at the ready, could relate: The sweet corn was her favorite, too, at the time. After hemming and hawing between flavors like Basil Goat Cheese and Banana Bread with a Fudge Swirl, the customer decided to try something new: a scoop of Watermelon Hibiscus Ginger sorbet. Other customers seem to have the same instinct: They gotta go back in there. 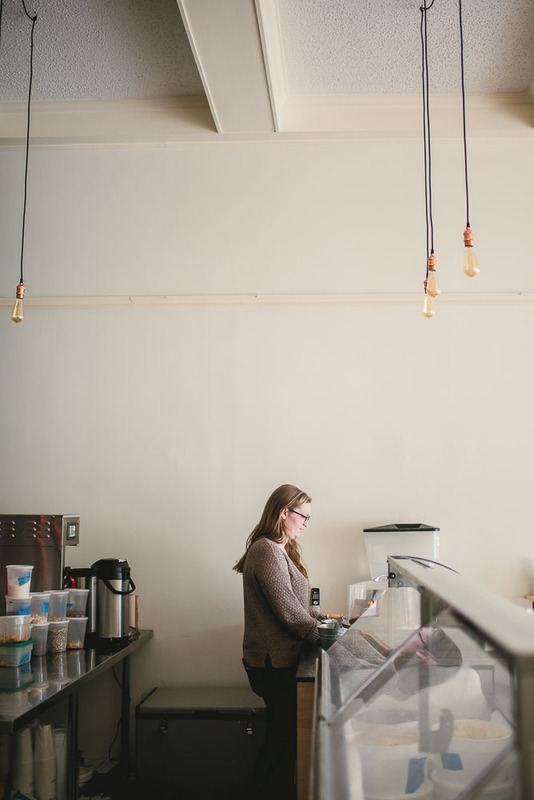 By January, a wintry afternoon finds Honeycomb Creamery with customers cozying up to each of the few wooden tables, settling in with a cone or hot chocolate and a laptop. The shop is filled with natural light and smells like warm pastry, sugar and jam—Rummel has been busy testing a recipe for blueberry hand pies. Though the storefront, located on Massachusetts Avenue between Harvard and Porter Squares, opened on the cusp of a chilly autumn, Rummel was confident. People have told her that New England consumes the most ice cream per capita, even during the colder months. Her optimism has panned out: Business has been steady, encouraging her to continue churning out new seasonal flavors. Rummel, 27, didn’t set out to be an ice cream entrepreneur. “I didn’t know what I wanted to do, but I loved the idea of creating,” she says. After moving to Boston from Delaware with a degree in Romance language and literature, she knew she wanted a change, and gravitated towards a job at Clear Flour Bakery in Brookline. She went on to attend the Cambridge School of Culinary Arts, then moved into a position at Union Square Donuts. The popular doughnut shop was only two months old when she hopped on board, and Rummel watched and learned as the small shop grew into a flourishing business, easing her apprehension about starting a business of her own. “I may not be as successful, but working with the issues and problems that arose there gave me the confidence that I can handle my own,” she says. She wanted to make all toppings and mix-ins in house, too, right down to the sprinkles and gummy bears. 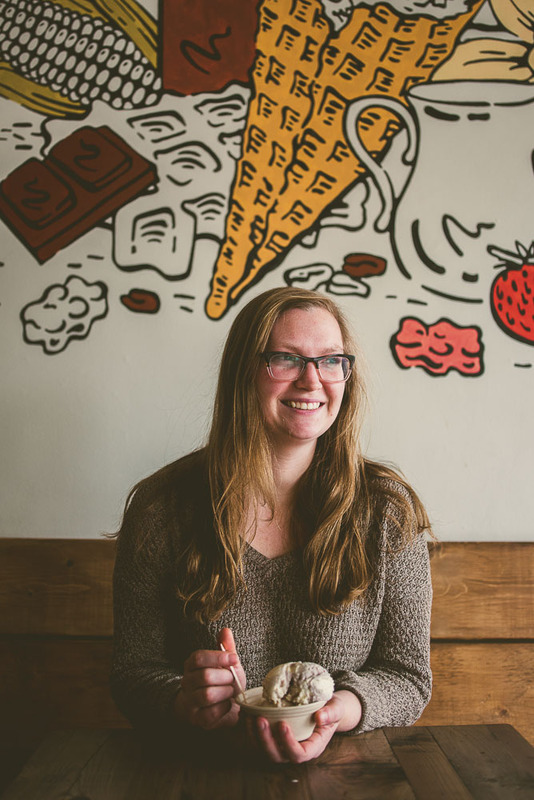 A few short months later, she launched Honeycomb Creamery, selling at farmers markets, festivals, pop-ups and via a now-defunct door-to-door pint delivery service. Rummel churned the ice cream in small batches in a commissary kitchen, with her husband, Rory Hanlon, lending the occasional hand. True to her vision, everything was homemade, even the crispy waffle cones with their alluring vanilla perfume. Initially a one-person business, Rummel’s plan was to keep things small at first, testing the waters, garnering feed-back. That feedback has been important, because Rummel says that she and Hanlon, both born and raised outside of New England, “didn’t realize how big of a deal ice cream is in New England.” Honeycomb’s customers would spend time waxing lyrical about the ice creams of their childhoods, the ones they still remembered, after all these years. “It was great hearing stories from our customers—how they would go to the farm and get ice creams on weekends,” says Rummel. “They have this strong devotion to good, locally made ice cream.” Honeycomb Creamery tries to honor that devotion by sourcing all-natural milk and cream from Jersey cows at Mapleline Farm in Hadley, and with mostly local and in-sea-son ingredients woven throughout. Just as with that pivotal corn-flavored ice cream, Honeycomb’s flavors are often inspired by dishes that Rummel tastes. “I could be out eating something, and I’m, like, ‘Oh, these flavors are really great—I’d love to put them together,’” she says. Other inspiration comes from in-season produce at farmers markets; that popular Sweet Roasted Corn with Blackberry Jam flavor, for example, was a result of Rummel noticing corn and blackberries together at the vegetable stand during a summertime trip to Kimball Farm. Beloved ingredients sometimes beg for experimentation and morph into new concoctions, like another of Rummel’s favorites, Brown Sugar Vanilla Bean. Accessibility for vegan customers, and a goal to look further than the typical vegan sorbet and into a rich, creamy option, produced Vegan Horchata made with a base of coconut cream, brown rice milk and cocoa butter, with a dash of cinnamon. At the current brick-and-mortar location, Rummel has even more room to experiment. A flavor called Honeycomb has become a signature flavor, and not only because it shares the shop’s name. Ribbons of honey caramel weave through a luscious base, studded with pieces of crushed honeycomb candy. It’s easy to see why this has quickly become a best-seller. The menu sparkles with small touches of genius—the kind that bring about those smack-your-forehead moments of wonder as to why we don’t see them more often. 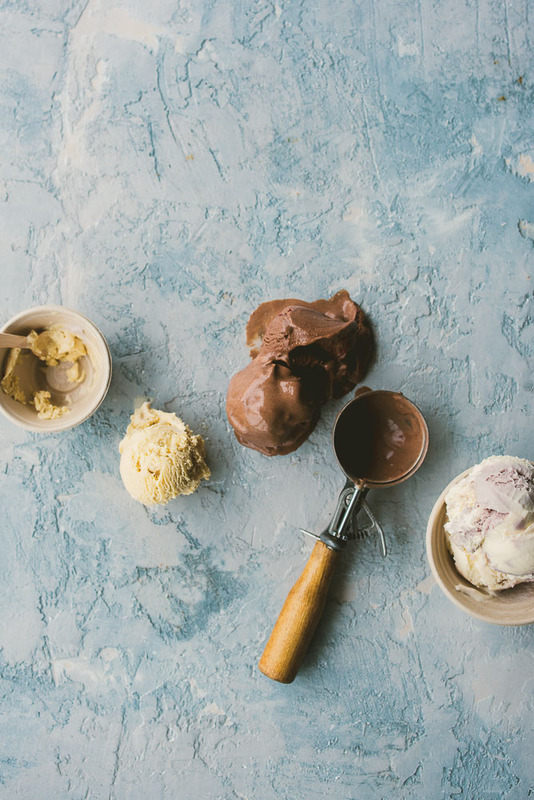 Perhaps the most exciting of these is an ice cream flight: small(ish) scoops of four different flavors that prevent the indecisive, or adventurous, among us from ever having to make up our minds. A drizzle of maple syrup, available as a seasonal topping, is an absolute winner on flavors like September-seasonal Apple Brown Butter. The combination tastes like it was made for New England. One may also discover that one of Honeycomb’s warm, freshly made Liège waffles, complete with its crunchy sugar crust, is an ideal vehicle for a scoop of—well, of any ice cream flavor, really. Housemade gummy bears have featured flavors like lemon and white wine, which, at one cup of wine per 700 bears, would unleash a bellyache long before causing any intoxicating effects. The gummies will rotate seasonally, including flavors like chai, cinnamon and peppermint. Honeycomb makes most mix-ins and top-pings in house, even the flaky sea salt that is available as a topping for 25 cents. Rummel fills 20-gallon buckets of seawater at Good Harbor Beach, boils the water down until only the delicate crystals remain, and spoons these out for sprinkling over scoops. It takes only a single taste to realize how ingenious a dusting of salt on ice cream can be; the splendid saline contrast is perfect with flavors like Bourbon Pecan Pie or Dark, Dark Chocolate. Salt is also folded into some of the ice creams themselves, like Salted Honey, Honeycomb’s answer to the salted caramel flavor available in so many other shops. “People are a little bit, like, ‘honey, what?’ I love that one,” says Rummel. She sources dark, tangy honey from Carlisle Honey in Tyngsboro, folds it into a lush, creamy base and then balances its sweetness with a touch of salt. Rummel is often surprised by what customers like—she does admit to “flavor pro-filing,” expecting that customers will enjoy certain flavors. One surprise had to do with her expectation that flavor preferences would break down by age categories—that younger customers would be attracted to classic flavors, while adult customers would be more willing to try something new. Yet, shortly after opening the storefront, Rummel says, two kids under age 10 fell hard for the Basil Goat Cheese flavor within a single afternoon. Goat cheese made the smooth ice cream base slightly tangy, with an herbaceous note from the basil leaves that had steeped within. This story appeared in the Spring 2017 issue.